A ribbon tied into a bow adds beauty, mystery and anticipation to a gift. A swift tug of the ribbon loosens its knot … and puts you a step closer to uncovering the surprise within. 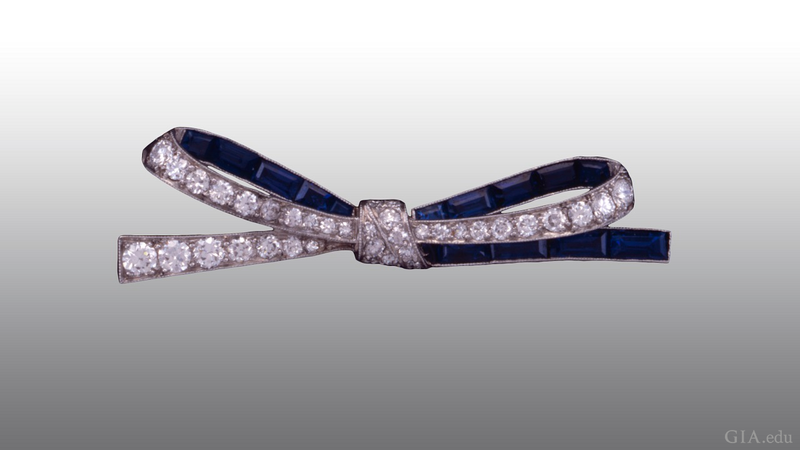 The feminine charm of the bow evokes love, longing and remembrance. 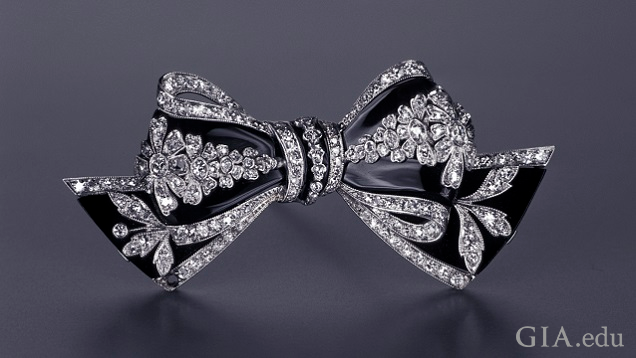 The perennial bow has been a popular motif and finishing touch in jewelry and fashion from time immemorial, recurring and adapting to reflect the style of the era. 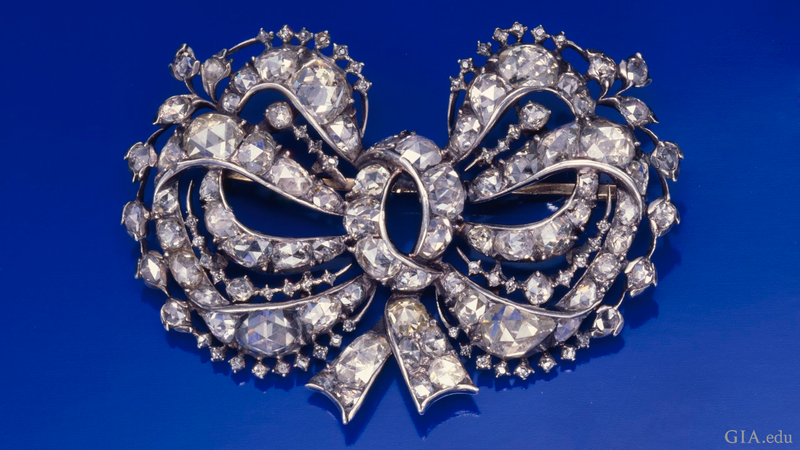 We see bows in jewelry from the 18th century to modern day and, by studying them, learn how their design and style has evolved through the ages. Bows appeared in jewelry as early as Roman times, probably originating with the practice of tying a string around the finger to remember something or someone. 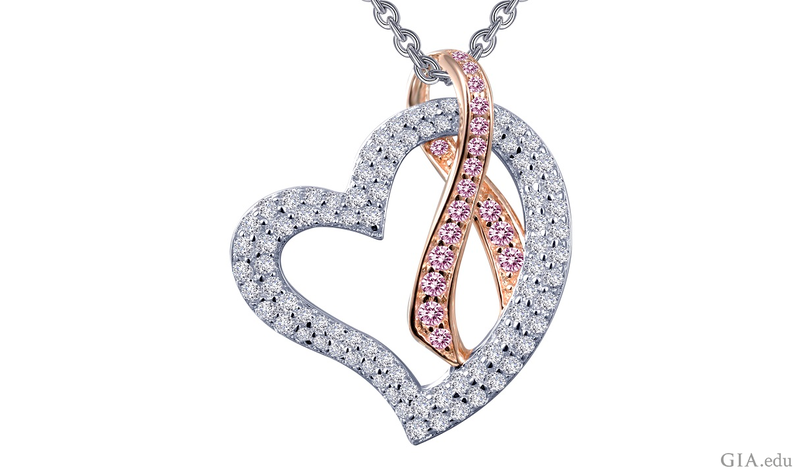 The lover’s knot is a complex design of woven wire, symbolizing love, friendship and affection. It is a variation of the bow knot, adapted from sailing knots. In modern times, a lover’s knot is given as an engagement ring or in marriage – to tie the knot. During the Baroque period (1601-1700), bows were a prominent motif in jewelry, portraits and design. The prevalence of the bow in this period may be traced to the practice of using a ribbon to secure ceremonial military medals of honor to uniforms and to pin elaborate gold jewelry to dark, royal robes. In the second half of the 17th century – the late Baroque period – a new style of jewelry was introduced to compliment new, lighter fabrics that became available through expanding global trade in both fabric and gemstones. The pastel shades were a softer background for a new trend toward naturalistic jewelry that would later reach full bloom in Victorian and Art Nouveau styles of the 1900s. 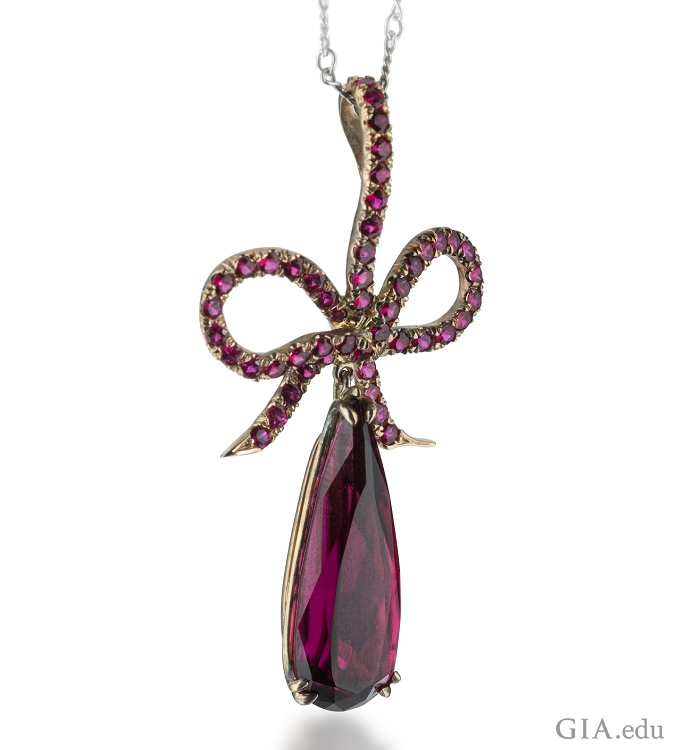 Swirling patterns of gemstone and pearl bows and ribbons emerged in this new era of personal adornment. 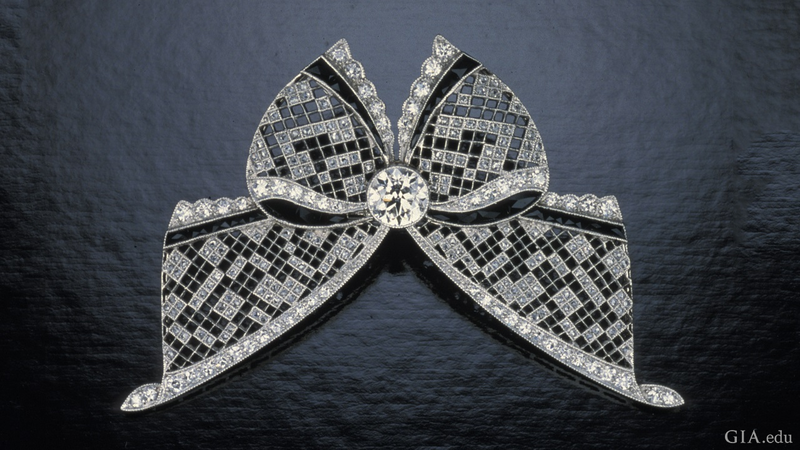 The bow motif also appeared in the in the court of Louis XIV (1643-1715), when gold or silver was shaped into loose double bows and attached to necklaces or brooches. 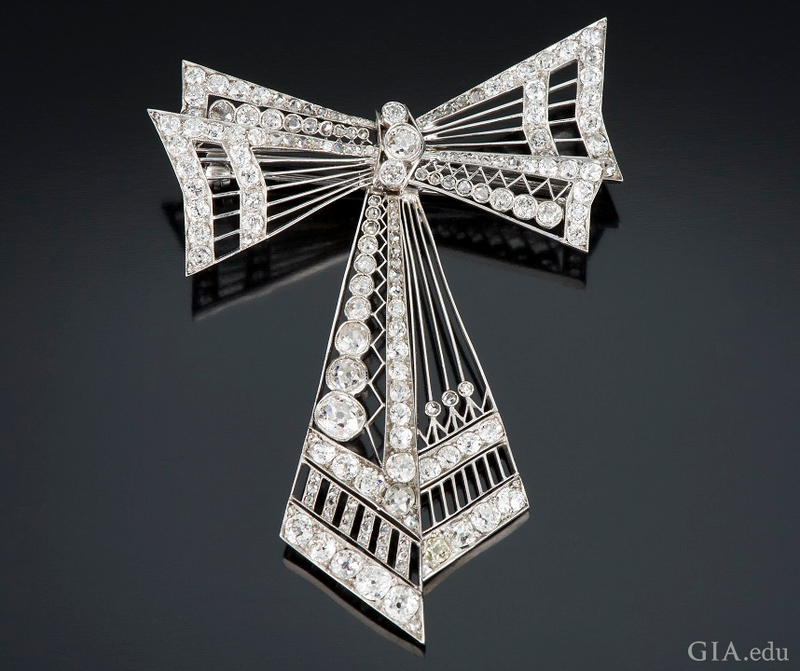 Even though it was an era where emotions were held in check, there was a playful side to wearing bow jewelry around the neck. If the bow was pinned near the heart, it was a sign of being in love. 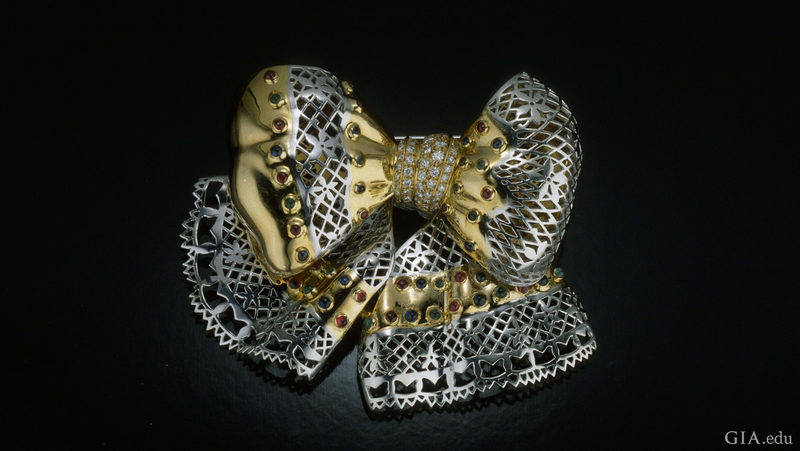 Two styles of bow brooches became popular during this time: the sévigné and the girandole. 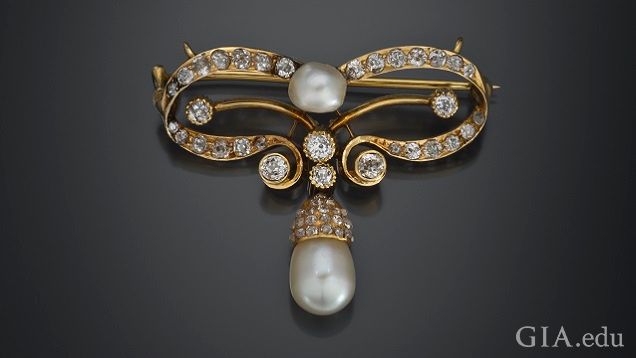 The sévigné is a flat, symmetrical ribbon bow brooch that later evolved into a more elaborate style, the girandole, or chandelier style, that suspends three dangling pear-shaped ornaments from a central bow motif and is fashioned as a brooch or earrings. The sevigné is named for the Marquise de Sévigné (1626-1696), a French aristocrat remembered for her letters discussing philosophy and the arts of the salon culture during the reign of the Louis XIV. Black materials, such as jet, onyx and enameling were fashioned into bow motifs and worn as mourning jewelry by Queen Victoria (1819-1901) after the death of her husband Prince Albert in 1861. Pinned near the heart, mourning jewelry was also worn in remembrance for those who died in World War I. 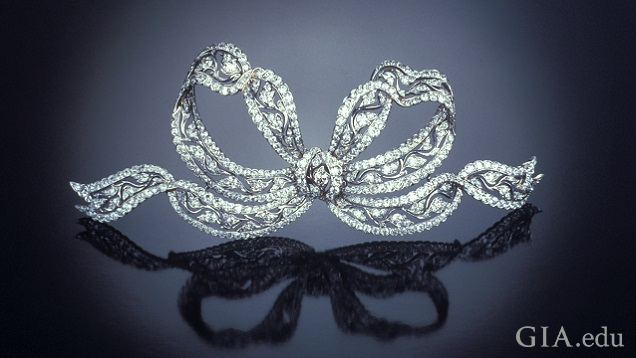 In contrast to the symmetry of the 17th century, Edwardian era (1901-1910) bows took on the appearance of lace, with delicate and airy designs fashioned by saw-piercing openwork that was set with colorless diamonds. 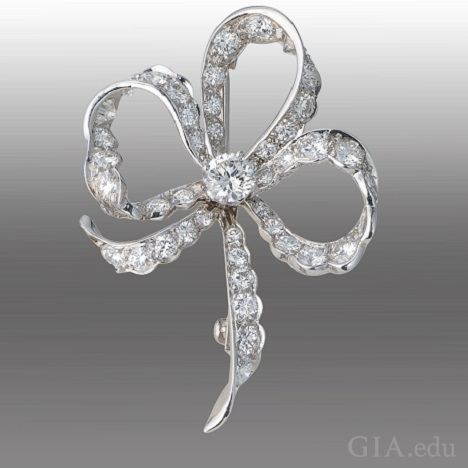 Later, during the Art Deco (1910-1939) period, bows were fashioned in both soft, ribbon-like form and in angular, symmetrical style, some featuring diamonds set in gold or platinum. 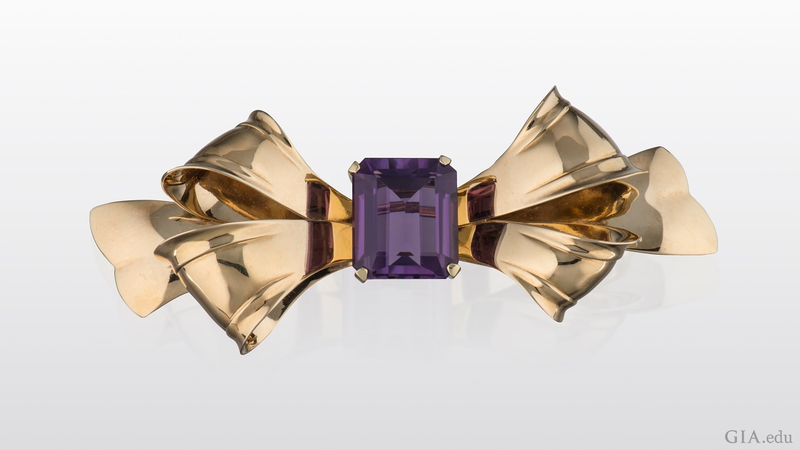 Bows in contemporary jewelry take their inspiration from past eras. The motif may be the same, however, the material, technology and fashion always changes. For example, the looped pink ribbon, a simple variation of the intertwined bow, has become a modern international icon of breast cancer awareness. The pink ribbon signifies health, vitality and empowerment of women. 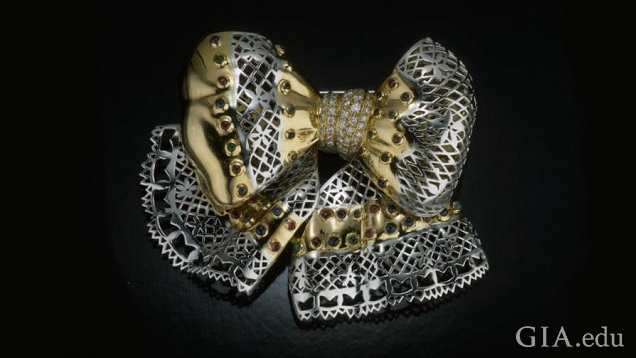 Remember, even though bows change with the times, they are always in style and add a loving touch to any gift.